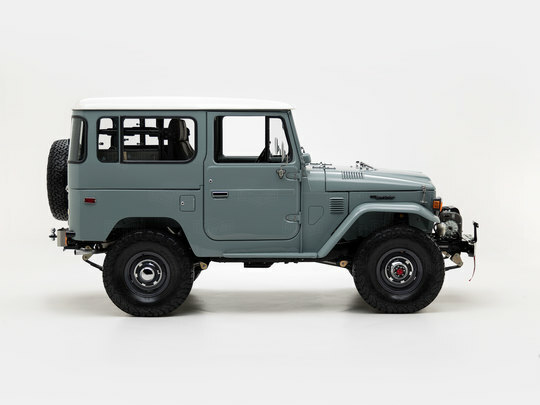 This FJ40 was designed for a client in Richmond, Virginia who wanted a reliable weekend driver - a Land Cruiser with classic looks that's actually fun to drive! We began with a well-maintained FJ40 with a solid chassis, straight body panels, and zero rust. Once our rigorous process was complete, our client hand-selected an array of classic and custom features, creating an FJ40 made for his kind of weekend. The exterior of this FJ40 is a mix of features from Land Cruisers of the past and is finished in a striking shade of Heath Gray (113). Inside, Corbeau® Sport seats are available for driver and passenger, and you'll find classic jump seats in the back. The interior is trimmed in gray vinyl, with an exposed metal dash, retro pull-knobs, and gauges. Our team rebuilt the original 2F engine, breathing new life into the carburetor that kept this 4x4 running strong for decades. Ride quality is further enhanced with a 5-speed manual transmission and Old Man Emu suspension. Revitalized power steering and front disc brakes, equip this FJ40 with better handling and stopping power, making it safer and more fun to drive. This FJ40 was born in the tradition of classic utility. Yet, you can still adjust the cabin temperature or connect your iPhone® to make a call or hear your favorite tunes. The modern world is always within reach, yet it never overwhelms the enduring qualities of the past.